A fine question! As is so often the case in science, the answer is both yes and no, depending on what kind of squid you are. Squid come in two metaphorical flavors: Myopsida and Oegopsida. They are usually characterized by lifestyle differences as neritic and pelagic squid, so you might wonder why the taxonomic labels aren't simply Neritica and Pelagica. It turns out they are named instead for the most prominent anatomical difference between them: the presence (in myopsids) or the absence (in oegopsids) of a cornea. The cornea is a transparent membrane over the lens of myopsid squid. It satisfies all their eye-covering needs, so they don't have actual eyelids (although sometimes people refer to the cornea as an eyelid for extra confusion). 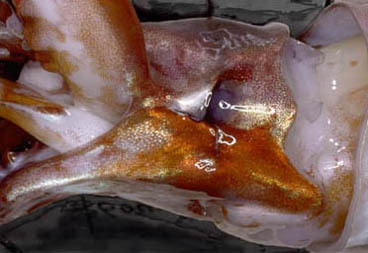 Oegopsid squid have no cornea, and consequently, their lenses are fully exposed to seawater. Most of the time they seem to be okay with that, but when scientists poke their eyes (or perhaps in other threatening situations), they'd like to be able to cover up. For that purpose, they have real eyelids made out of real skin. Here's an Ommastrephes bartramii winking at you. Some commercials are stranger than others. Most foreign commercials are strange because, well, they're foreign. This commercial's strange because a squid climbs out of a guys mouth and a piece of gum makes it disappear. Yea. Just watch. I was compelled to ignore the yucky marketing message of "chew our gum so you can cheat with impunity" and consider this commerical with my biologist hat on. It's not easy, being a cephalopodiatrist! You get these compulsions! Do you want to know what it's like? Do you want to be a real squid nerd? Go back and look at seconds 0:10-0:12 very carefully. Do you see the eyelids blink? Do you see which edge of the eyelid expanded in which direction, to make the blink? Note how the eyelid closed: The posterior edge of the eyelid expanded anteriorly providing most of the closure. Is that correct? Did that match the commerical? No, it didn't! In the commercial, the anterior edge of the eyelid provided the closure by expanding posteriorly. I have a weird desire to chew gum now.